Is this a guessing game ? Which GPU is in your PC? Is Vegas 15 now fully supportive of the GPU in my PC? From the Render As dialog box, you can now swap all of your project media video files for video files with the same names (but potentially different file extensions) enabling you (for example) to work with proxy files on your timeline and switch to the full-resolution files to render. After the render completes, the files are swapped back. Note what Vegas 15 does not support NVDEC for now, but it is in plans. If you have NVidia card and AMD CPU most load will fall on CPU during editing. Vegas still much prefer Intel desktop CPUs with QSV (not HEDT!). :-) Resolve is most common destination for people leaving Vegas. One thing I do not like in Resolve is what they want to put as much as it holds in it, while having small team. Resolve full version's $300 price tag isn't problem to me. It's huge advantage if I can do everything inside one software, as I have now used Resolve anyway in the last step to grade the shots. Issue with Resolve for now is specially crippled H.264 operation in free version, lack of NVENC support that Vegas has now. As I understand they have plans to cripple free version more with each release. I think the new features sounds good. But Resolve's new NLE and DAW features makes me want to switch to it. If only they made it $49 for all existing customers of 14 and 13. And note - no bug report from Magix, no new build fixing this, no web site warning - nothing. Someone in the Vegas Pro Community Forum posted the fix. But you had to look for it, and then dig deep into the innards of the program to disable the new encoder. You want too much, they released software very short time ago. And working on update. Where else you have product development head and developers talking on product forum with people and reading all angry reports? They'll improve. One of the few new features in Vegas Pro 15 is the ability to decode those GH5 422 avc clips. Well, it turns out that this feature results in the disabling of the ability to play audio in many if not all avc clips! H264 clips that play fine in Vegas Pro 14 play on the timeline with no audio at all in 15. I spent many hours trying to figure out what was going on. I coincidentally switched to 15 from 14 just after I started using a new camera. So, naturally I though there was something odd about the camera clips. That is until I imported them in 14 and they worked fine. What's the fix? Disabling the brand new avc decoder that was installed as the default, which plays the GH5 files! This may also disable hardware rendering. So, essentially one of the key new features in 15 cripples normal use. I'm moving completely over to Davinci and not looking back. End of the road after 10 yrs of use. The upgrade pricing just isn't worth it, IMO. ACES 1.0 support enable users to work with the expanded color spaces and dynamic range of modern cameras. Redesigned timeline clip events now contain headers to hold important information and buttons and can be customized through the hamburger button/menu system. Upgrade is expensive. Interface changes are minimal, clearly not major. Looks more like 14.1. @Glenn7 why? Can you explain it? Some details please. I used to love this editor. But v15 is really dissapointing release. Work more efficiently than ever before with a customizable user interface and precise, fast editing tools. Drag-and drop editing and authoring make quick work of production and delivery. Mix, match and edit popular formats, including HEVC, ProRes, AVC, and more, directly on the timeline without waiting for a re-wrap or transcode. Powerful hardware acceleration takes advantage of NVIDIA and Intel QSV technologies to shorten the rendering process. Designed and built specifically to save you time and enhance your creativity. DVD or High Definition Blu-ray Disc authoring With its drag-and-drop workflow, DVD Architect, included with VEGAS Pro, makes it easy to author a professional-quality DVD or Blu-ray disc. Drag your media onto the workspace to automatically create custom navigation for feature videos, director’s notes, sound track music and more. Create custom keyframe-compatible graphic animation and overlays by importing multi-layer Photoshop files. A simple settings re-set enables you to burn an SD DVD and then switch and burn a HD Blu-ray disc. Requires an OpenCL-enabled GPU such as HD Graphics 4000. 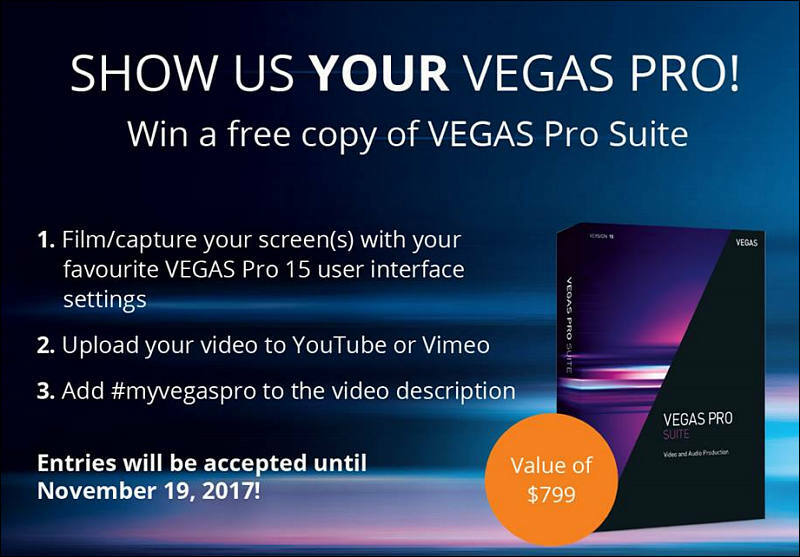 As most of you know, VEGAS Pro has always relied on your computer hardware for everything it does. In fact, VEGAS Pro was the first NLE to allow you to run on virtually any modern PC. You didn’t need any special hardware to edit your projects, and you still don’t. But VEGAS Pro 15 also taps into additional hardware that you may already have in your system. For example, more and more machines support Intel® Quick Sync Video (QSV), and VEGAS Pro 15 leverages that technology to significantly accelerate both reading and writing certain file types. With that and other hardware (as well as software) optimizations, you’ll see more robust timeline performance and faster render times for certain formats.